I have been involved in dog agility since 2000. 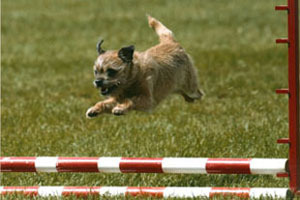 My first agility dog, Django, a Border Terrier, won the 2003 National Agility Competition of Canada in her height division. Thanks to her, I found a new passion in life! 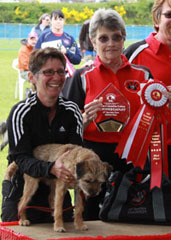 My second agility dog, Dizzy, another Border Terrier, is currently competing both in Canada and in the US. 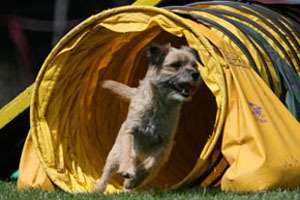 In 2009 he was the number 5 Border Terrier in agility in the US and both in 2012 and 2015 he placed 1st at the BC Regional Agility Championship. For my third dog I decided to branch out and get a Border Collie. Zappa is teaching me how I need to handle a fast and powerful dog! In 2014 he was the Biathlon Gold Medalist in the 26" class at the 2014 USDAA NW Regional Championship, placed 4th in Biathlon at Cynosport in Morgan Hill CA and in 2015 he snagged 1st place at the BC Regional Agility Championship. I keep up with new trends in agility handling and attend multiple seminars and camps every year. I am well versed in the Derrett system of handling but currently draw my inspiration from Justine Davenport and Susan Garrett. I actively compete in AAC, AKC, USDAA and UKI. When I first started teaching dog agility I was interested in teaching advanced handling to advanced students and dogs. Then I taught my first complete beginner class. I was inspired with how gratifying it was to teach people and dogs who were just starting out. I love seeing the progress and I love opening up a whole new world to them. I taught dog agility at Paws Ahead in Burnaby from 2007-2011. During that time I came to realize that good training in basic foundation skills is essential to a student's success and overall enjoyment of agility. When I left Paws Ahead to start running my own classes, I was determined I would offer students the chance to learn the basics correctly from the start. 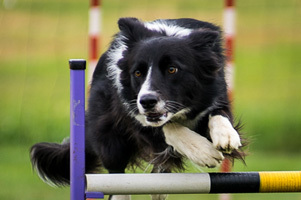 Doing agility is much more than having your dog perform the obstacles. I will teach you how to maintain connection with your dog, when to reward and how to reward your dog, and how to teach your dog both self control and speed. As you progress into course work, you will learn how to make good handling choices and give the dog the information needed in a timely manner. I will help you become a team with your dog and we will keep it FUN!